In honor of The Self-Made Billionaire Effect purchases, PricewaterhouseCoopers LLP is making a significant contribution to DonorsChoose.org, an online charity that connects public school teachers in need of classroom materials and experiences with individual donors who want to help. PwC's gift will support financial literacy projects around the country. Imagine what Atari might have achieved if Steve Jobs had stayed there to develop the first massmarket personal computer. Or what Steve Case might have done for PepsiCo if he hadn’t left for a gaming start-up that eventually became AOL. What if Salomon Brothers had kept Michael Bloomberg, or Bear Stearns had exploited the inventive ideas of Stephen Ross? Scores of top-tier entrepreneurs worked for established corporations before they struck out on their own and became self-made billionaires. People like Mark Cuban, John Paul DeJoria, Sara Blakely, and T. Boone Pickens all built businesses—in some cases, multiple businesses—that are among today’s most iconic brands. This fact raises two profound questions: Why couldn’t their former employers hang on to to these extraordinarily talented people? And why are most big companies unable to create as much new value as the world’s roughly 800 self-made billionaires? John Sviokla and Mitch Cohen decided to look more closely at self-made billionaires because creating $1 billion or more in value is an incredible feat. Drawing on extensive research and interviews, the authors concluded that many of the myths perpetuated about billionaires are simply not true. These billionaires aren’t necessarily smarter, harder working, or luckier than their peers. They aren’t all prodigies, crossing the billionaire finish line in their twenties. Nor, most of the time, do they create something brand-new: More than 80 percent of the billionaires in the research sample earned their billions in highly competitive industries. The key difference is what the authors call the “Producer” mind-set, in contrast with the far more pervasive “Performer” mind-set. Performers strive to excel in well-defined areas, and are important. But Producers are critical to any company looking to create massive value because they redefine what’s possible, rather than simply meeting preexisting goals and standards. Combining sound judgment with imaginative vision, Producers think up entirely new products, services, strategies, and business models. Big companies tend to reward Performers and discourage the unconventional ways of Producers. But it’s the latter who integrate multiple ideas, perspectives, and actions, and who trust their insights enough to make game-changing bets. This book breaks down the five critical habits of mind of massive value-creators, so you can learn how to identify, encourage, and retain such individuals—and maybe even become one yourself. 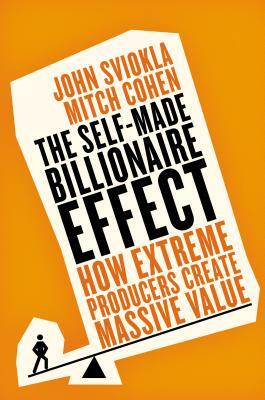 The Self-made Billionaire Effect will forever change the way you think about talent and business value. JOHN SVIOKLA is head of Global Thought Leadership at PwC (PricewaterhouseCoopers LLP). He serves a variety of Fortune 500 clients on the topics of strategy and innovation and runs The Exchange, the firm’s think tank. John has held various leadership roles at PwC as well as at other public and private companies. He was on the faculty of the Harvard Business School for twelve years. John has written for the Harvard Business Review, The Wall Street Journal, Financial Times, and Sloan Management Review and has appeared on CNBC and Fox News. MITCH COHEN is vice chairman at PwC. During his thirty-three years at the firm, including more than twenty years as a partner, Cohen has held a variety of leadership roles and has served numerous Fortune 500 clients. —DONALD J. GOGEL, Chairman and CEO, Clayton, Dubilier & Rice, Inc.